Donovan Harden, wide receiver, approaches the season with a target on his back from opposing defenses. After losing some of Georgia State’s top receivers to graduation, the Panthers welcomed six newcomers as well as returned several familiar faces such as Penny Hart, Robert Davis and Todd Boyd. While Georgia State’s receiving core strengthens everyday, the Panthers said farewell to one of their key receivers Donovan Harden. Transferring to Georgia State from Illinois State, Harden brought along his ability to break records and ultimately prove himself to be named one of the Panther’s most valuable receivers. Totaling 60 receptions, 885 yards and seven touchdowns in 2014, Harden showcased a record-setting performance against conference rival Georgia Southern. Receiving and scoring four touchdown receptions, Harden broke a Georgia State record with 186 receiving yards while tying the most receptions in a game with 11. Despite the team’s best efforts, The Panthers finished with a 1-11 season record (2014-15). After missing the first three games of the 2015-16 season due to injury, Harden was able to follow his previous successful season by totaling 39 receptions, 725 yards and 5 touchdowns in 2015. Harden made his first appearance against Liberty where his first catch was a 76-yard touchdown. Which stands as his longest touchdown for the 2015-16 season. Harden stands in the top five in Georgia State history finishing with 99 catches for 1,610 yards, 12 touchdowns and 3,010 all-purpose yards in a total of 22 games. Being named one of the top receivers in the Sun Belt conference, along with returning senior Robert Davis, Harden’s success rate on and off of the field will be missed. Last season, 2015-16, the Panthers finished with a regular season record of 6-6 as well as attended their first ever bowl game. Soon after falling to San Jose State in the Autonation Cure Bowl, Georgia State began preparing for the new season. Even with losing key receivers such as Harden, Nyiakki Height, Avery Sweeting and Kam Myers, receiver coach, Coach Lappano, remains confident in his receiving core. A year ago ,now sophomore, Penny Hart was that young talented freshman receiver with zero playing experience. Each week Hart progressed on the field which earned him a breakout freshman season. 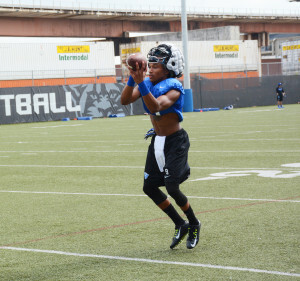 As a freshman Hart came in as the top receiver in 2015. Hart totalled 77 receptions, 1099 yards and eight touchdowns while leading the Sun Belt conference in receptions as well as receiving yards. These accomplishments landed Hart to be named Sun Belt Conference Freshman of the Year and make first-team All-Sun Belt. Hart has been named to the Preseason Watch List for the Biletnikoff Award along with veteran teammate Davis. This award is presented to the most outstanding receiver within college football. Davis is now entering his fourth and final season as a Panther. Totaling 61 receptions, 980 yards and six touchdowns last season, the first-team All-Sun Belt receiver will enter his senior season as one of the top receivers in the Sun Belt conference. Averaging 16.1 yards per catch last season while scoring his longest touchdown of 75 yards against Oregon, Davis consistently displays his explosive abilities. Boyd stands as the fifth leading receiver for the Panthers. Totaling 25 receptions, 296 yards and two touchdowns, Boyd is set to showcase more of his abilities this upcoming season. “Todd Boyd is as good as a route runner we have,” Coach Lappano said. “ You can’t get the ball to everyone. We have good running backs and good tight ends. Todd doesn’t get the ball as much as those other guys, but that doesn’t mean his skillset is any less because it’s not. With Davis entering his senior year, he now stands as a leader for the receivers as well as the offense as a whole. Davis has been taking notes from the receivers that helped mold him into the player that he is today. Davis’s many experiences have allowed him help the freshman receivers on a teaching level as well as a personal level. In addition to Duckworth, Georgia State welcomed five other freshmen receivers: Jonathan Ifedi, Matlin Marshall, Eric Elder, Devin Gentry and Jawan Nobles. Nobles attended Campbell High School in Smyrna, Georgia where he played quarterback, wide receiver and kick returner for the Spartans. Along with football, Nobles also ran track in high school. Receiving region champion in the 200 and 400 meters, Nobles was also named Cobb county champion in the 100 meters and the 200 meters as a junior. Thus, bringing his top speed to the Panthers. Coach Lappano continued on to compare Duckworth to Davis. Elder stands out with his ability to play inside and outside while maintaining ball skills and good speed. With the six newcomers showing great potential for the Panthers, Coach Lappano trust the skills presented in the receiving core.